All The end of the Amazon Product API!? Is this the END OF THE AMAZON PRODUCT API?! 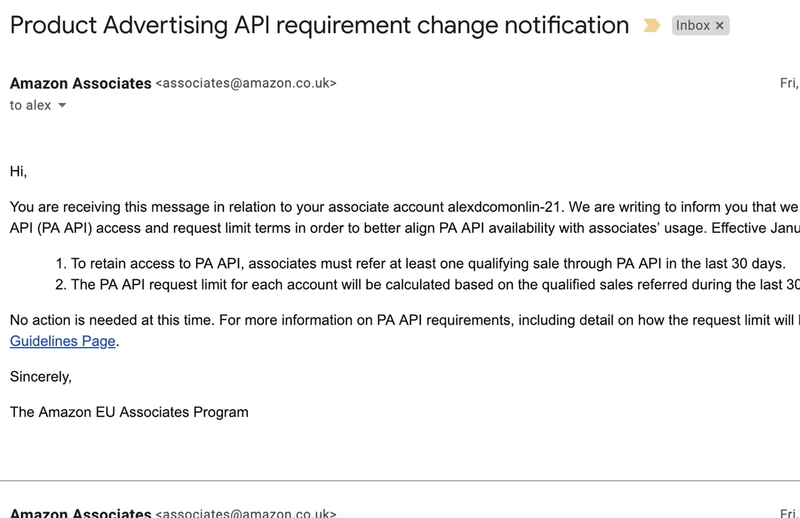 I got an alarming email this week from Amazon informing me that if I don’t generate at least 1 sale every 30 days my access to the API would be revoked! What does this actually mean? What will happen to my sites if I lose Amazon API access?! Well, when I stopped flapping and panicking, I realised, it isn’t quite as catastrophic as I had initially thought. So first and foremost, stop worrying. The end of the world is not nigh. But you do need to take note and get your ducks in a row. If you’re using the Woozone plugin and have the shopping cart enabled, you are allowing people to put items in the shopping cart on your website and then when they checkout, all the stuff in their basket then goes in their Amazon cart and the transaction is completed there and you get the commission. Doing it this way is good. You have nothing to worry about. Providing you are generating at least one sale every 30 days. If you’re not generating sales, you may lose access to the API. You can reapply for access but you need to bump up your sales first. 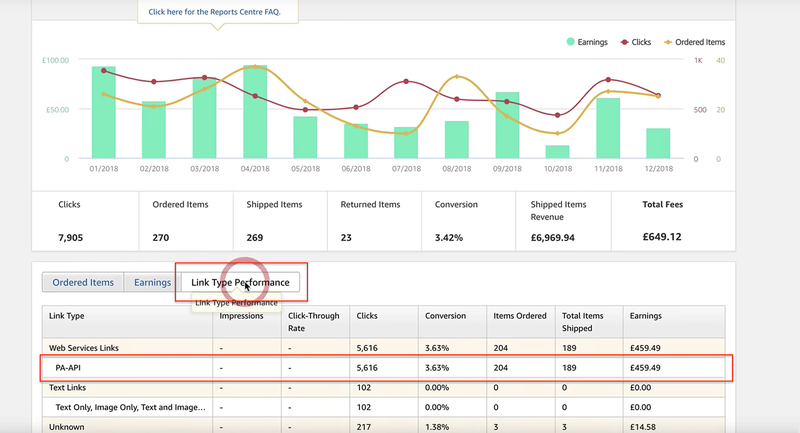 We did a video back in November where we played around with turning the shopping cart off in Woozone to see if it had any impact on conversion rates. So instead of shopping and adding products to the basket on your site, the user would click to buy a product and be sent directly to Amazon. If you decided to use this method and have disabled the cart within Woozone, the link that passes that user to Amazon is just a normal text link, so any sales do not count as Amazon API sales. But fear not! We spoke to the Amazon Associates team and they pointed out a setting within Woozone that changes the links that are generated when you turn the cart off. When you go into Woozone, navigate to Plugin Setup. There is an option titled Show Amazon URL as Buy URL. Change this to NO and that should do the trick. A user will click to buy a product and will be taken straight to Amazon where the product appears in their cart, just like it does when you’re using the API. We’ve tested it and it looks like it works perfectly, so the links do count as Amazon API links. So, if you do have your cart disabled in Woozone, we suggest you change that setting so that sales are attributes as Amazon API sales and you get to keep hold of API access so you can continue importing and synching products. You can find out the traffic you are sending to Amazon via your Amazon Associates dashboard. Scroll down and find the Link Performance tab. There you can see the number of clicks and sales generated via the API and other types of links. What would happen if Amazon took away your API access? Firstly, don’t panic and don’t give up. If they took away API access then you would have to spend more time promoting products via good quality content. You should be doing an element of this anyway. Don’t rely wholly on a shop or product catalogue. Focus on producing unique, quality blog posts to promote products and add links using SiteStripe. Then, once you’re generating a few sales, you can reapply for API access. One sale a month shouldn’t be too hard to achieve. If you can do that and make sure your links are correct, you should be OK. And if they do revoke access, don’t give up. Concentrate on generating sales through content and blogging. I’m confused – Say we lose access to API…. How do we drive sales through it to regain access? Or is it sales through other link types?